Extreme Ironman Triathletes find a way to train, race and enjoy life. It’s 5 a.m. in Cozumel, Mexico. Julian Murphy of Chicago carries his wetsuit, goggles, event swim cap, and water bottles full of sports drinks into transition. He finds his Trek TTX triathlon bike at the location he racked the night before. He scans his gear to be sure it’s still all there: bike helmet, bike shoes, running shoes, bib numbers. He slathers on sunscreen body glide and chamois butter. It’ll be a long day, running across the finish line at dusk. It’s his 12th Ironman, and Kona is on his mind. Murphy describes himself as self-motivated and highly organized. He reads training books and tweaks his training based on what works. He also coaches a grade school track program in the spring and cross country in the fall. Years ago, Murphy enjoyed recreational cycling and dabbled in century rides. He ran an Olympic distance triathlon while at the University of Michigan, buying running shoes a few weeks before the race. In 1999, he leapt into Ironman competition, doing his first at Lake Placid. Murphy kept going from there, notching three Ironman races in three months during 2013: Ironman Wisconsin in September, Ironman Florida in early November and Ironman Cozumel three weeks later to bring his career total to 12 and enter the Ironman Legacy Program for the World Championships in Kailua-Kona, Hawaii. The program grants entry to the coveted event to 100 athletes from around the world who have completed a minimum of 12 full-distance Ironman branded races. To his dismay, Murphy was not selected for 2014. He’s not giving up by a long shot. This year, Murphy is on the athlete roster for Ironman Wisconsin, two half Ironmans and two or three Olympic distance triathlons. He’ll enter the Legacy program again, hoping the second time he’ll get the prize to race Kona in 2015. Finding the time and energy to keep up the training is a juggling act, Murphy says. At times, he has to be creative, fitting in seven to 10 workouts a week to his busy schedule. Weekly training includes two to three swims sessions, two bike sessions and three to four runs. If he has a lighter workday, he’ll train in the morning, but he schedules the majority of his training after work and time with his kids. He regularly joins a Masters swim group from 9 p.m. to 10:30 p.m. and typically snoozes six hours a night. When doing two workouts a day, he’ll swim on the day of a hard bike or run. He reserved for half-day bike rides and long runs. Occasionally, Murphy will do a long run on a trail while his kids bike next to him. “My best race was in Florida with 10 hours of training a week, running 25 miles a week with 17 miles being my longest run,” Murphy says. Long before the sun is up, Amanda Wendorff, 34, wakes to pack her bag with meals, snacks, sports nutrition and a few changes of clothes for the day. The Ironman triathlete and lawyer is off to swim with Well-Fit training organization in Chicago with a dozen athletes or more before settling into her desk for a full day of corporate litigation with Eimer Stahl, LLP, on Michigan Avenue. If she can’t squeeze in a run at lunchtime or ride her bike to swim at Ohio Street Beach, after work she’ll lace up her favorite Brooks running shoes to zip south down the Lakefront Path or hop on her Cervelo P3 tri bike to hammer out intervals on the Computrainer at the gym. She sometimes doesn’t return home until 11 p.m. to fall into a deep slumber before she does it all again the next day. “There aren’t many opportunities when we reach our 30s to do this: to be able to see what my limits are. It’s very motivating,” Wendorff, a past high school swimmer and track star, says. “The last 10 to 13 miles of an Ironman are challenging. I love the training and competing. Once she started her law career, she stopped exercising and gained weight. When she turned 30 and a long-term relationship ended, she decided to get into shape and try triathlon. Logging up to 20 hours a week of training can be tricky. “Balancing everyday responsibilities takes a lot of planning and time management,” Wendorff says. “Sacrifices are made and my social life takes a bit of a hit.” She works with her coach training year round, with long runs and bike rides on the weekends sometimes topping seven hours a session. But it’s all paid off. 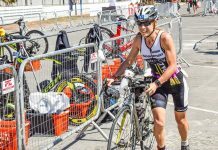 She competed in the Ironman World Championships in Kona in October 2013 by qualifying at the Ironman 70.3 Auckland, New Zealand event with a second place age group finish. Wendorff also won her age group in April competing in the Puerto Rico 70.3. When work requires travel, she searches for pools, gyms and running routes convenient to where she’s staying. With intense training, she’s dealt with some knee issues and Achilles tendonitis that required her coach to tweak her training schedule to keep her going. In 2014, she plans to compete in Eagleman 70.3, Ironman Coeur d’Alene, the USA Triathlon Nationals in Milwaukee, Ironman 70.3 Worlds in Canada and several more races at varying distances to help her prepare and train for Ironmans. “I am now at a point where I can’t imagine living without triathlon and have a huge circle of wonderful people in my life who I have met through the sport,” Wendorff says. Ray Pelelas is a multisport fanatic. 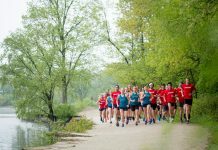 In June, he’ll run the 56-mile Comrades Marathon in South Africa, ride the 200K Horrible Hilly bike race in Wisconsin and race two Olympic distance triathlons, all to prepare him for Door County Half Iron in July, then tackle Ironman Wisconsin in September and Ironman Florida in November. 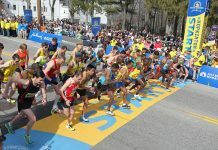 Pelelas ran marathons for 10 years before turning to triathlons. He’s raced 10 Ironman events since 2009, finishing three his inaugural year, each two weeks apart. He admits that was a little crazy. The many miles that span the Ironman distance keeps Pelelas intrigued, since the chances for mishaps rises exponentially over the course of the day. When others falter, he says strong and steady, increasing his chances to do better than his age group competitors. He had to draw upon his stamina last fall when his mother was diagnosed with ovarian cancer, he got married and raced Ironman Wisconsin two weeks after his wedding. He and his wife, Anastasia, enjoyed their honeymoon in Maui, Hawaii, then Pelelas returned home to compete in Ironman Florida on Nov. 3. Pelelas knew he had banked preparation from doing each discipline three times per week with long bikes and runs on the weekends. He sacrificed some training but was motivated to not give up and race for his mom. This year, Pelelas continues to focus on training clients between 7 a.m. and 10 a.m. and fits in his workouts mid-day, typically doing open water swims at Ohio Street Beach, cycling and running by himself during the week, then coaches clients again between 5 p.m. and 8 p.m. Pelelas organizes his training year into 16-week blocks three times a year, with training blocks building into each goal race. Time management may prove to be a bit more challenging for Pelelas, who is moving with his wife in June and hopes to start a family soon. His sights are on Kona after he completes his 12th Ironman later this year. With mixed emotions he says he’s not looking forward to Kona’s difficult course, but the race, he imagines, will be an amazing experience.